Yes, it can be done, and that’s not all. 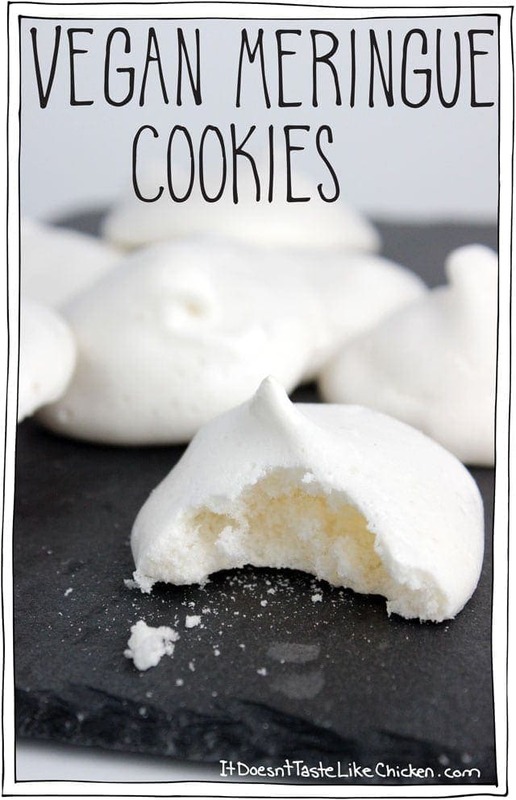 Vegan Meringue Cookies can happen in your kitchen with ingredients you probably already have in your cupboard! So what’s the secret ingredient? Aquafaba is what it’s called. Now let’s break that down a little. Aqua = water. Faba = bean. So what does that make? Bean water!! I know, you are totally drooling right now. Bean water cookies. Yum? It’s true, you can make a meringue out of the water that’s leftover in a can of beans, and it’s basically exactly the same result as if you were to use egg whites, except totally vegan! Celebrate, yay, exciting, hands to the sky, woot woot! I am not the brilliant genius who figured this out, in fact there is a whole site dedicated to the genius: aquafaba.com here you can learn about the history of aquafaba, the science, and you can even buy an aquafaba t-shirt if that’s something you need in your closet. It’s a pretty amazing discovery and the vegan community is going wild. I see lemon meringue pies, macaroons, and fluffy batters in the future… and all with an ingredient that I was throwing out. Pure brilliance. After a few experiments I discovered the key is to buy chickpeas that are unsalted or no salt added. When I tried making meringues with a can of chickpeas that had salt added (check the ingredients), they were still pretty darn good, but they did have a slight smell and taste of bean. Not terrible, but not what I was aiming for. When I used the water from a can of unsalted chickpeas, that bean taste disappeared and all you can taste is perfect meringue heaven. Scrumptious. Some serious meringue connoisseurs (aka friends) tried these, and they actually preferred them to egg white meringues. Win for the vegans! How do we make these delights? 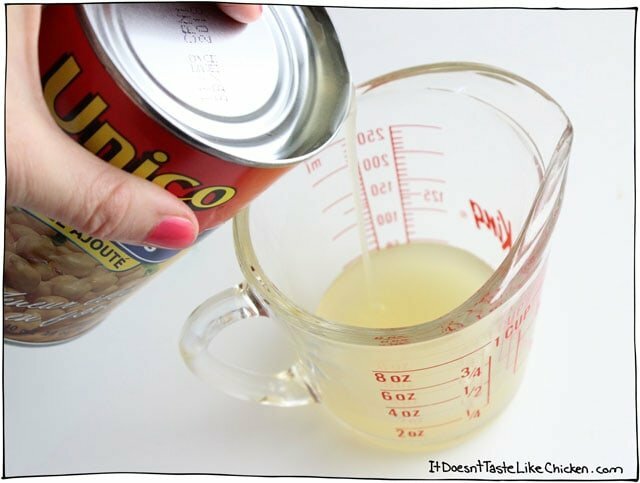 Take a 19oz can of no salt added chickpeas, and pour out all of the liquid. It should make about a cup of liquid. Save the chickpeas to do whatever you like with later on. 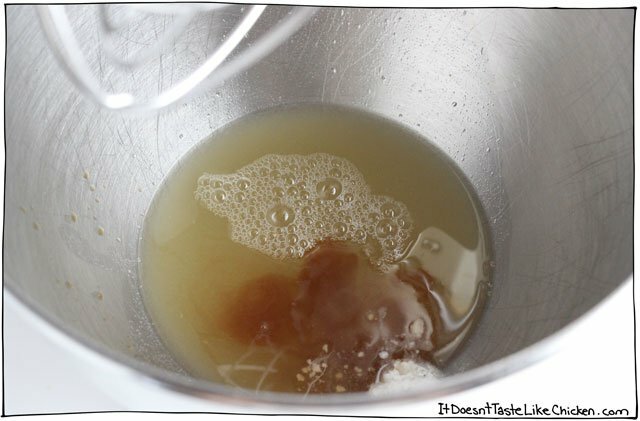 Add the chickpea liquid to a mixer bowl along with the vanilla and cream of tartar. Start blending on high and slowly add in the sugar as it beats. You may need to stop and scrap down the sides to get any of the sugar that is stuck to the sides of the bowl. …Still too soft, keep beating. Ah, just right. When you lift the beater the meringue should hold a stiff peak, even if you jiggle the bowl, the peak should stay as is. It took me about 6 to 6 1/2 minutes to reach this stage in my mom’s Kitchen Aid Mixer. Now line a large baking sheet with parchment paper. You can stick down the corners of the parchment by adding a small dot of the meringue, to help hold the parchment in place. 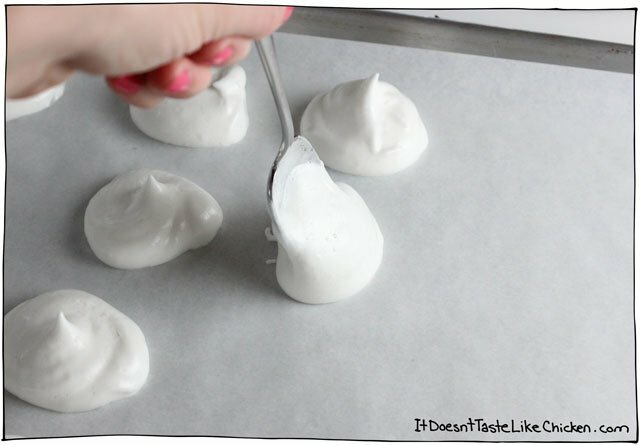 Use a pastry bag or a spoon to dollop the meringues on the baking sheet. 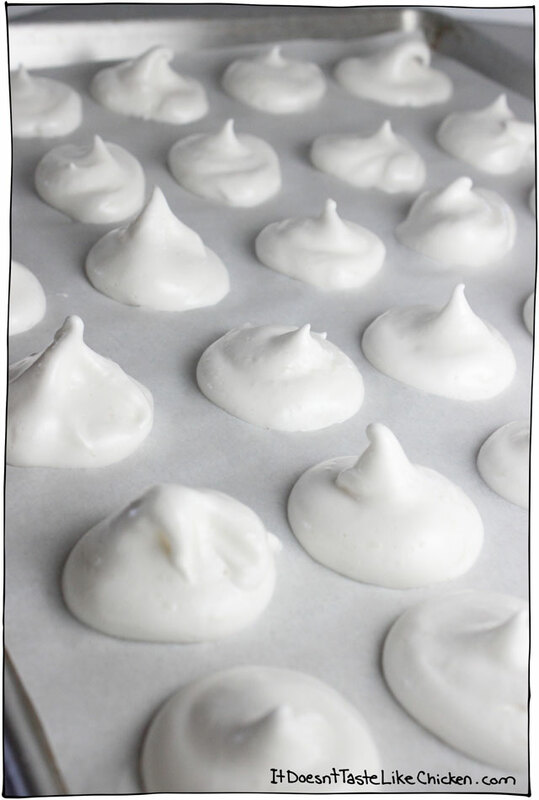 When you are done you will have a whole bunch of pretty little meringues, ready to go into the oven. Bake for 1 1/2 to 2 1/4 hours, rotating the pans half way through. Now it’s a little difficult to tell exactly when they are done, and I really racked my brain on how to share this information, but there is not much of a visual cue, so you are going to have to go with your gut a little on this one. If the meringues are small or you want a chewy center, opt for less time. If they are large or you prefer a meringue that is crunchy all the way through, opt for more time. It’s not very easy to tell when they are ready just by look, so the best way is if you are able to take one out of the oven, (carefully tear a piece of parchment off with a meringue on it) let it cool, and see if it’s are the correct texture, and if it is, take the rest out of the oven. If not, bake longer. When you take them out of the oven, let them cool and enjoy! Store in a dry place so they maintain their shape. This recipe was inspired by the geniuses at aquafaba.com be sure to check them out for more inspiration. Thank you for the awesome directions and recipe. While we are not a vegan family, my husband is allergic to eggs. I’m excited to experiment with aquafaba to make him new goodies that he has never been able to eat before. 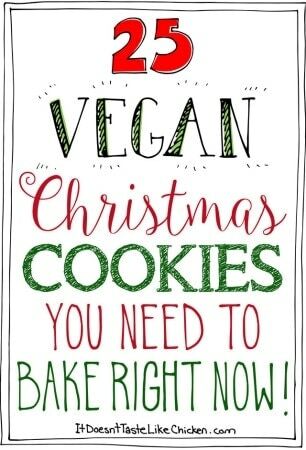 Vegan recipes aren’t just for vegans! They sure aren’t! They’re for everyone! The more vegan recipes that people enjoy, the better. 🙂 I hope your husband loves your new egg free recipes! I can’t wait to try these for Easter!! I have made lemon “meringue” pie twice and it turned out really well so I know this will too. My question is…I would like to colour these for Easter and I am wondering if anyone has tried this. Say cherry juice for pink. I don’t know how a turmeric yellow would taste though? Would this extra liquid hurt the process? 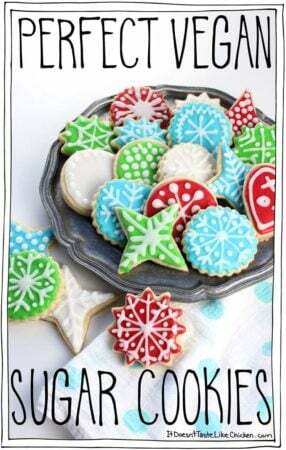 And, can these cookies freeze until they are to be used. I’m leery to try this right before the day. Thank you so much for this posting and chance to dialogue! Hi Karen, you can use just a few drops of vegan food colouring and mix it in along with the vanilla extract. These food colorings are made using natural juices if that’s what you are looking for. I wouldn’t recommend freezing them, but if they are stored in an air-tight container, as long as no moister gets in, they should keep fairly well. Enjoy! “Aqua = water. Faba = bean. Why must so many internet vegans be childish idiots? “Totally. Woot woot.” Yes, I’m vegan. But you, you’re just someone running with a fad. You’re vegan because you don’t think and someone told you what to think. Please. Shhhhhhh. Go away quietly. You give us a bad reputation. Some of us aren’t so moronic. But wait! Of course! Maybe you’re only pretending to be that dumb. That way you sell your ads to the really dumb ‘vegans’. Enjoy your sleep tonight. Pretty sure I’m not the one who looks like a childish idiot right now. Have fun trolling, David! What a horrible, pointless comment David. YOU give us a bad name. When happiness and enthusiasm offends you, that is a much deeper issue that you have within yourself that needs to be addressed, I hope you find happiness and true contentment in the future. Another great recipe Sam, keep doing you! We love you and are so grateful for the effort and dedication you put into providing fabulous recipes and spreading the vegan message in a kind, approachable way. You rock girl!!! Wow, I’m impressed. I wasn’t a fan of mirengues before I was vegan but I had two cans worth of aquafaba so I thought I’d give it a try. I ate two and had to put them away to not eat more. They are so good. One question: Can I use the water from other canned beans (kidney, fava, etc). Or is there something special about the chickpea that imparts something special into its water? Oh weird! What browser are you using? I will see if I can fix the problem. I was so intrigued by this, I just had to try it. So since I had chick peas for lunch, I did the meringues in the afternoon. It did take a good 15 minutes of whipping but it worked! Kept their shape in the oven too! Who knew! The foam before it was cooked also tasted yummy! Brilliant! Haha, isn’t it so cool? So happy you enjoyed it! I was amazed at how this (started to) turn out, but once in oven for 20min they started to go brown, I panicked and opened to turn them around – and bam, deflated, so they were flat, slightly torn, and brown. The top tray went back up, bottom bit didn’t, but they still went browner and browner – in the end I took them out after 40minutes even though I knew there was no way they were done as they were burnt to a crisp on the outside, uncooked inside. That said I was AMAZED by the bean juice!! And after it was whipped I ate quite a bit of it before it went in oven , de-lic-ious. Oh no! Sorry they didn’t work out for you. It sounds like your oven is too hot. It’s not uncommon for ovens to run a little hotter or a little cooler than what the readout is. You could try picking up an oven thermometer, they are often farily cheap. Hope that helps! how should these be stored? air tight container at room temp, or in the fridge? Airtight container at room temperature. Just note that if these get underbaked or the air is humid they may soften. But as long as it’s nice and dry they should keep for several days. Enjoy! Thanks for the recipe. This recipe worked perfectly and tasted delicious. Having read various blogs I followed instructions to make homemade aquafaba from soaking chickpeas, and ensured I reduced the liquid and cooled it to the consistency of raw egg white. I couldn’t detect any chickpea taste whatsoever. Very happy. I will now attempt using aquafaba to make a pavlova and other desserts. Amazing discovery! So happy it worked out perfectly for you, Sheila! Isn’t it so cool!?!?! Can I soak the chickpeas myself and then Use the water? I’ve never tried it myself, but here are some instructions on how to do it from another site. Enjoy! Just made these today. They are delicious, Sam!!! Yay! So happy you enjoyed them, Carmen! Mine keep melting!!! I think I may have gotten a small amount of water in the batter. Would that be why? After a minute in the oven they become sugar Aquafina water…. Hmmm… I did a bit of research and this site seems to say that there are several reasons why that could happen, but that it is likely from not whipping it enough. Do you think that might have been the problem? Just used red kidney bean water with a tablespoon of cocoa powder to add flavour and hide the murky colour! Haha! My pleasure! For the next time, if you beat them longer, I noticed that the aquafaba doesn’t seem to get over beaten and break like egg whites do, so no worries about over doing it! Enjoy! Oh, that’s an interesting tip! Thanks, Savanna! Sam, I love you. I read the above and my heart just smiled as I myself giggled, and maybe jiggled at the same time. Bahahahaha! Whoops!! That’s a funny typo, haha. Big hugs to you, I hope you enjoy your meringues! My favorite meringue cookies are coffee pecan. I cant wait to try the aquafaba. This sounds perfect because I don’t like super sweet cookies. My new favorite is to add ground pecans and a little Starbucks Italian Roast Via or instant espresso to standard a meringue kiss recipe. 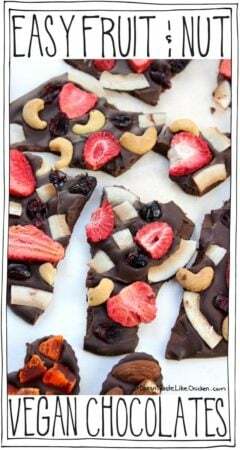 I like it better than my usual with white chocolate chips or crushed candy canes. Hi Sam, can I use canderel instead of Sugar? 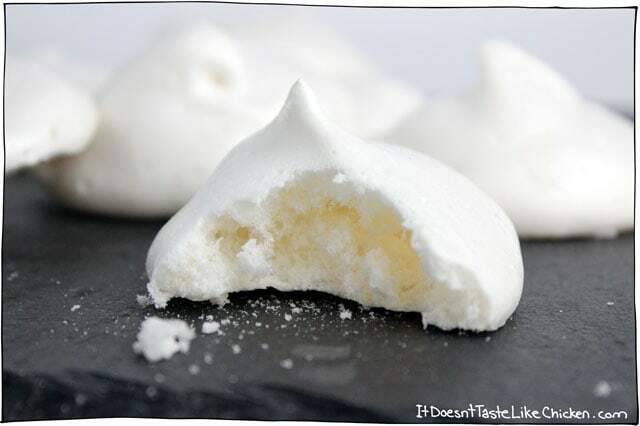 Hmm… I’ve never cooked with canderel or any artificial sweetener, so I tried doing a bit of research to discover if meringues could be made with artificial sweetener, and from what I found, it doesn’t look like there is a lot of success. Hope that helps! I made these today. For those of you looking, I found salt free chickpeas in the natural foods section of my grocery store (Giant), rather than with the rest of the canned beans. The texture is spot on, but I still found them…. beany. (I actually really dislike chickpeas anyway, which is part of the problem.) I’d still be interested in trying it with another type of bean. I think that folks who haven’t encountered the ingredients list probably won’t be bothered by the flavor, though. I wonder if different brands of aquafaba have different tastes? I served mine to a professional baker and she was blown away by them. Glad you loved the texture Arielle! I tried making these tonight, but can you tell me what might be wrong? The batter tasted great and I got stiff peaks after probably ten minutes with my stand mixer. I baked them for two and a half hours at 200 and they never hardened at all- they were still totally sticky and not at all solid. I turned up the oven to 250 out of desperation and ended up blackening them, and yet they were still gooey. We don’t have much humidity. Any insight? Thanks!! It’s a bummer they didn’t work for you! It’s difficult to know without being in the kitchen with you, but it just sounds like they needed to bake longer. Slightly varying temperatures in ovens, humidity in the air, slightly different measurements can all have an effect. If you try them again, after the two-hour point, I would just check on them every 15 minutes until the desired texture is reached. Hope that helps! Hi Sam, can I used this for a meringue topping for a fruit pie, like lemon meringue pie that is not going to be baked or will it not hold shape unless its cooked? My favorite cookie when I was not vegan was raspberry meringue cookies with raspberry jello can I use vegan jello to get the same affect. Some of my classmates made raspberry vegan meringues not too long ago using fruit puree. I’m not sure what their ratio was but it is possible. I just made these for the first time! I used Aquafaba with sodium, and the meringues still turned out, but there is a slight chickpea flavour. It didn’t affect anything else though! I baked them for probably an hour and 50 minutes and they turned out nice and crunchy! Oh no!! Exploded!? I have never heard of that before. My guess is that your oven temperature might have been to high and an exterior shell was formed before the interior was cooked? If you think that might be right you could pick up and oven thermometer to test your oven. Is it ok to use the liquid from great northern white beans instead of the liquid from chickpeas? If so, what makes chickpea liquid so specially suited for this? I have never tried it myself, but yes, apparently all beans work the same. If you give it a go, let us know how it tastes! The bean taste was definitely there, but that is because there was sodium added. Oops! I also had a hard time getting them to take shape, but the texture was perfect! In any case, they were a big hit at the potluck I took them to, so it worked out in the end! I don’t like canned beans. Can I subtitute with water from the chickpeas cooked in pressure cooker? 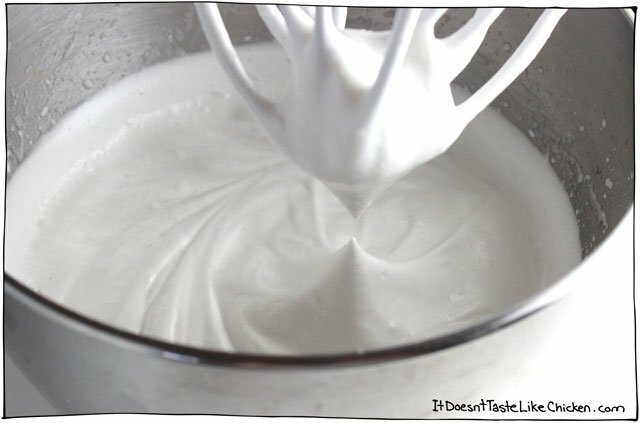 I haven’t tried it myself but this YouTube video explains how to make aquafaba. Hope this helps! I just put my pan into the oven, and I am AMAZED! I think this vegan meringue beat up silkier than the egg meringue! I’m curious to see how they’ll taste out of the oven. I only had salted chickpeas, so I used almond extract to give them a little bit of a cherry flavor (to mask any potential “off” taste). The “raw” meringue tasted incredible…I never would’ve guessed they were vegan. I’m planning on making mint, mint-chocolate chip, chocolate, and cherry (with chopped maraschinos) in the future if these turn out well. Thanks for the recipe, and thank you for providing the link on how to make your own aquafaba! It’s so cool isn’t it!? I also find that there is no risk of over beating the meringue/ hope you love them Yvonne! Your flavour additions sound amazing!! Hi Marni, white sugar isn’t vegan if bone char is used to refine the sugar. I believe this is a practise only used in the US as far as I know. Many brands are totally vegan, you just have to check with the company to find out. Here in Canada, one of the more common brands of white sugar is vegan as you can see on their FAQ page. In the US any organic sugar will be vegan if you are unsure of what brand to buy. Hope that helps! Also you can buy vegan white sugars. That are specifically labeled as such. In San Francisco I know Whole Foods carries it (I buy it specifically for baking) so I’m sure if you have the same or something similar near by, you could find it. Perfect! Thanks for the tip Marni! Thanks Maia, great to know! Oh I am so sad to hear that. 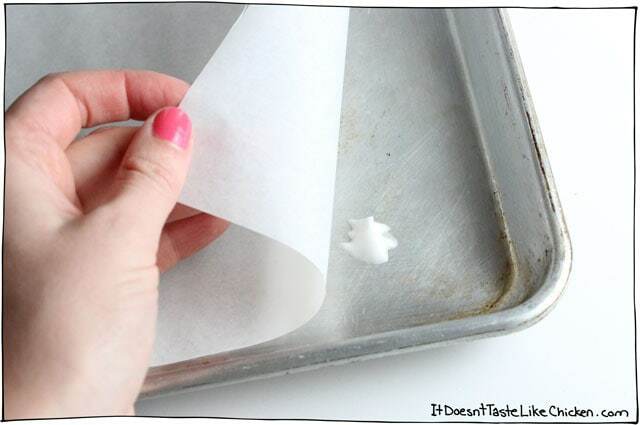 Make sure to use parchment paper, not wax paper so that the meringues don’t stick. Did you use aquafaba from a can of unsalted chickpeas? I find when you use the aquafaba from a salted can of chickpeas it has a lot more chickpea taste. Hmmmm it’s very odd that within one batch there were so much variation in the outcome. I am really not sure why. The only thing I can think of is if your oven has temperature differences… some ovens have hot spots. I wish I could be more help Eli! Oh, I’m sad too! Meringues are picky things whether they are vegan or not. 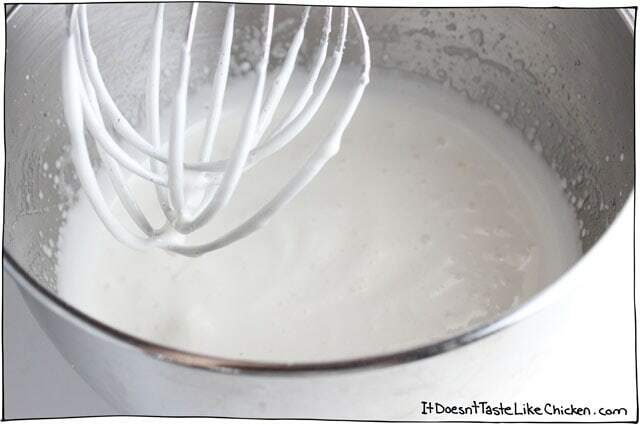 It sounds like maybe the meringue wasn’t whisked enough? It should have stiff peaks that stand straight up. If you think it was stiff enough other problems might be if it’s too humid. It’s best to make meringues on dry days. I hope those tips help? I want them to work for you! Hi iam excited to try this, pls tell me how to store the lft over aquafaba whipped cream and how long can I store it. Hmm, I haven’t tried it myself, but my guess is it wouldn’t store very well. The bobbles will likely, slowly pop, and you will be left with liquid. I would recommend using all the aquafaba when you make it. You can always half the recipe if you like. Alternatively, aquafaba would store for a few days in the fridge, or freeze well, before it is whipped (just the liquid from the can). Hope that helps! I live in the UK , can you tell what sugar you used was it caster or icing . Just made these for Easter, easily found salt free, did use a hand mixer, so it took a while. Plan to tweak the recipe a little, maybe some more vanilla, but the people who ate them all thought they were good and no one suspected that they were not made with eggs. Hi! I was really interested in this recipe, it sounds amazing. What do you consider a lot of salt? I can’t find canned chickpeas without added salt, the lowest I’ve been able to find has 0.3g for 100g. Do you think that would do the trick? I just finished making these and they turned out perfectly! I used a hand mixer and was standing there for about 20 minutes but it’s all good now. I’m really excited for my (non-vegan) family to come home and try them out! 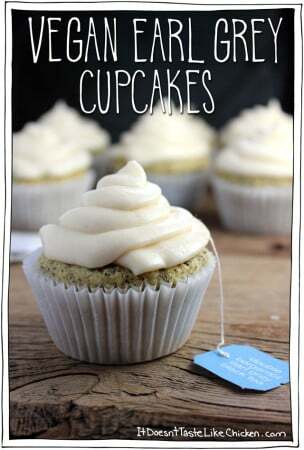 I made these yesterday and fooled people into thinking they were made with egg whites. Delicious. Haha! I love that. So happy you were able to fool everyone! Made these last night and they looked great – but they were totally hollow inside! Any ideas why? It has been years and years since I made any type of meringue (it was egg-based back then), but I don’t remember seeing this phenomenon before. Thoughts? This can happen with the egg-based ones too, it’s a result of too much air. So perhaps the meringue batter was beat a little too long? Hope that helps! Hey! Really loved this recipe it turned out great. To everyone who is wondering about the cream of tartar, I left it out (because I had none) and the recipe did work, it just increased the amount of time spent beating it (by about 20 min). I would definitely recommend the tartar, but it will still work otherwise. Thanks! Cream of tartar helps the aquafaba hold it’s shape. There isn’t really a substitute. If you must, you can try leaving it out but I am not sure how it will turn out. Hope that helps! 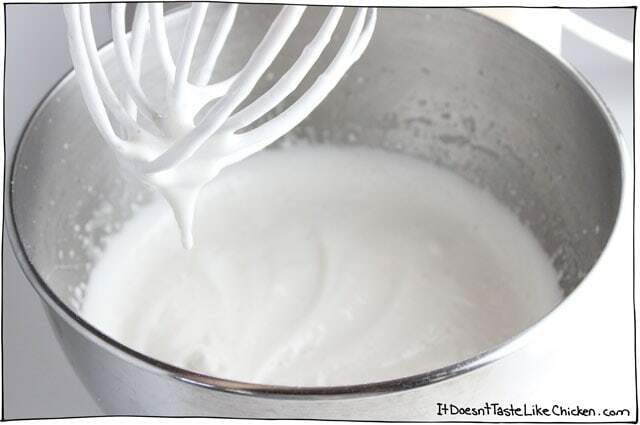 I don’t know if it works or not, but I’ve read that if you can replace every 1/8 teaspoon of cream of tartar (the amount needed per egg to make meringue) with 1/2 teaspoon lemon juice or distilled white vinegar. 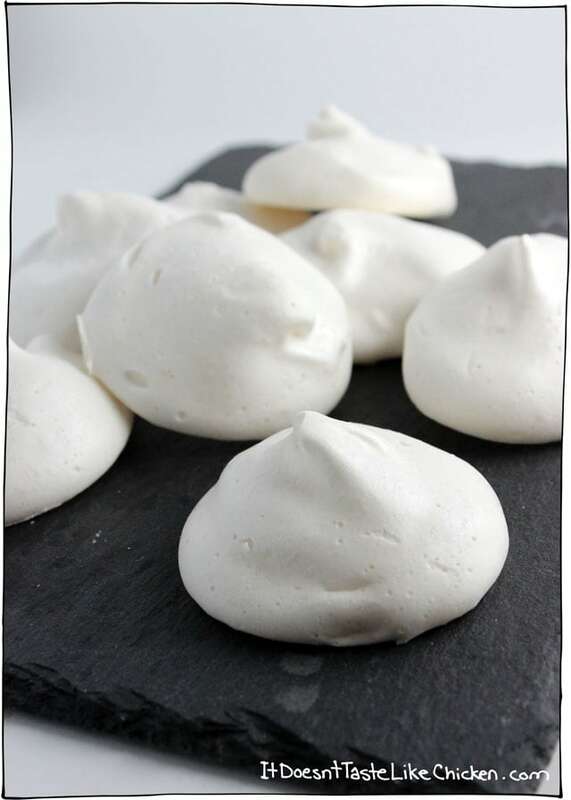 Hi, could you use this meringue to make a Pavlova, or does this recipe only work for small shapes. Hoping to make a Pavlova for Australian day and my vegan friend. Hello, great I was wondering if there was a cruelty free recipe. My question goes as to if its necesary to add tartar. Just curious, I noticed several comments asking about cream of tartar. I understand cream of tartar (potassium bitartrate) is a byproduct of the wine making industry. Is there another non vegan source of this? Or are people simply mistaking because it has the word ‘cream’ in it? Cream of tartar is vegan, my guess is that people just don’t have it on hand and are hoping to get away without a trip to the grocery store! Haha. I don’t typically use canned beans, would the water from cooking them be the same as the canned water? Would love to try this, but good canned chickpeas are so expensive! I haven’t tried it, myself but according to this Youtube video explains how to make aquafaba from scratch. Hope the helps! Does this merengue have applications for meringue pies too I wonder? oh I see below it does, that’s wonderful. Thanks for the post! Absolutely! I haven’t done it yet myself, but from what I understand, you can use aqua faba meringue the same way you use egg white meringue! It works so shockingly well, doesn’t it!? I was so skeptical too, but they really are amazing. Those aquafaba discoverers are amazing folk! Haha. So happy you loved the recipe Laura! Which B-12 do you take? I’m not too picky about it, as long as it’s a vegan B12 supplement, I usually go for one that is 2,500 mcg once a week. Here’s one that will do: http://www.amazon.com/Deva-Nutrition-Vegan-Sublingual-Tablets/dp/B00EW1BVIS Hope that helps! I am so excited to give this *another* try! I used canned garbanzos I had on hand, which–when I checked later–turned out to have a little salt and this may have affected the outcome (wouldn’t form peaks). Nonetheless, I was making your cranberry walnut chickpea salad sandwiches *anyway* and decided to reserve the liquid and try these meringue cookies. After what seemed like an eternity of whipping, I tried adding more cream of tartar to see if that would help the liquid form peaks. No luck. Finally I gave up, BUT I put the now creamy, sweet liquid over chopped fruit for a salad, and oh my! Score! I saved the rest (the 1 cup of garbanzo liquid yielded about 3 cups of frothy sweet cream) and will try it …maybe in my coffee? …in our vitamix-made ice “cream”? Anyway, thanks for revealing this very interesting bean “cream.” It will be interesting to see what happens with aquafaba in the future! Love your blog! Keep cooking! Thank you so much Lisa! I don’t know why peaks didn’t form for you… I had a look around the internet and saw that it took some people as long as 20 minutes to get to the peak forming stage. (It only took me about 6). So perhaps it just depends on your machine, or the brand of chickpeas you use. I am so happy you enjoyed the cream anyways. Putting it over fruit sounds lovely! I think 20 minutes refers to the people whisking/beating by hand. 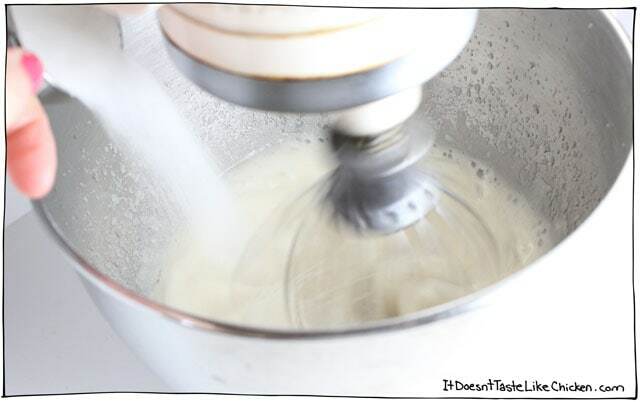 if you’re using a machine whisk, then its only 4 to 7 minutes. 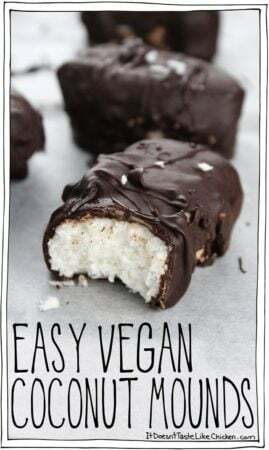 No one would ever tell these are vegan, really. So delicious! It’s totally true, people are amazed that they are vegan! I wonder if I could add a little bit of baking cocoa to chocolate them up a bit? I haven’t tried this myself, but I think it would work. 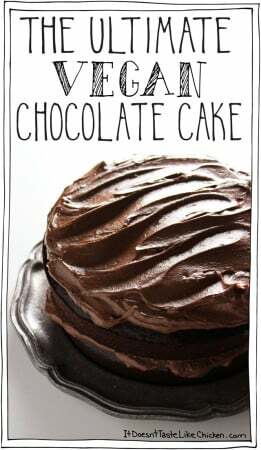 I would start by adding 1 Tablespoon of Cocoa Powder and see how that works. I tried this and the foam collapsed. oh bummer! Thanks for letting us know how it turned out for you. Amazing! I’m in awe! Thank you Sam for sharing this trick! Oh yes, you can definitely use this meringue for your mom’s super awesome raisin cookies! @Stephanie, I am super interested to know if there is a recipe for your mom’s cookies online someplace? I tired looking it up and I can’t find anything. Perhaps she made it up? I found lots of “brown sugar meringue”, but none with a raisin cookie under it. They sound amazing! This is genius! Question… I live on the coast, in the south, so it is humid year round. Do you think these will have the same issues that regular ones ( with egg whites) have with all the moisture in the air?